With old color movie film (all but Kodachrome) you can choose to have us process it the safest way possible i.e. into a B&W negative – or into color. About 15 to 20 percent of long-expired films processed into color will actually have decent color quality. Most of the others (processed into color) will turn out as recognizable, though will likely have little color fidelity remaining. Some though, will be blank when we could have salvaged an image if we’d processed into B&W. If salvaging an image from these films is the most important factor and you want to play it safe, then choose the B&W negative option. If color is important to you and you’re ok with taking some risks, choose the color option. Film stored in a cool place is much more likely to come out well in color than film stored in a hot or warm place. If you know your film was stored in a hot attic, garage or storage facility, then definitely opt for B&W. If the film was stored in a cool basement then you’re fairly safe to opt for color, though the color may still be poor. We give you enough resolution to do a snapshot sized print and if the film is in good shape, your print will look good too. These images are more highly compressed and have a much smaller pixel dimension than what you will receive if you order an image from the cart (optional step 2) for 99 cents. If you have important images, we do recommend you add them to the cart to get the higher quality version of the picture. Though not always a night and day difference, with less compression and more resolution the image will certainly look better if you’re viewing it full screen on your computer or doing any print larger than 4 x 6. Our idea is that this works as a sort of insurance policy for people that either don’t know what is on their film or the condition of the film. Clients with pictures that are important to them might pay more than clients with pictures that aren’t. These Kodakcolor negatives were processed in the 1970s by the Kodak Company. We believe because Kodak was using a proper stabilizer, the negatives have stood up quite well over time. They are a nice warm orange color in the highlights and a deep tawny brown color in the dark areas of the film. Negatives in this condition will scan much better and are less likely to need Photoshop editing than the pictures on the right. This is the exact same brand of film from the same client and of the same time period as the film pictured on the left. We believe that the less reputable photo finishers were simply skipping the stabilizer step at the end of the process, leaving the negatives to fade much more quickly over time. Negatives that have faded to this purple color will benefit greatly from color correction in Photoshop. Q?What is film acceleration and why and when do we do it. This is an example of an accelerated film. In this case it is a Kodacolor-X roll film from the late 1960s. 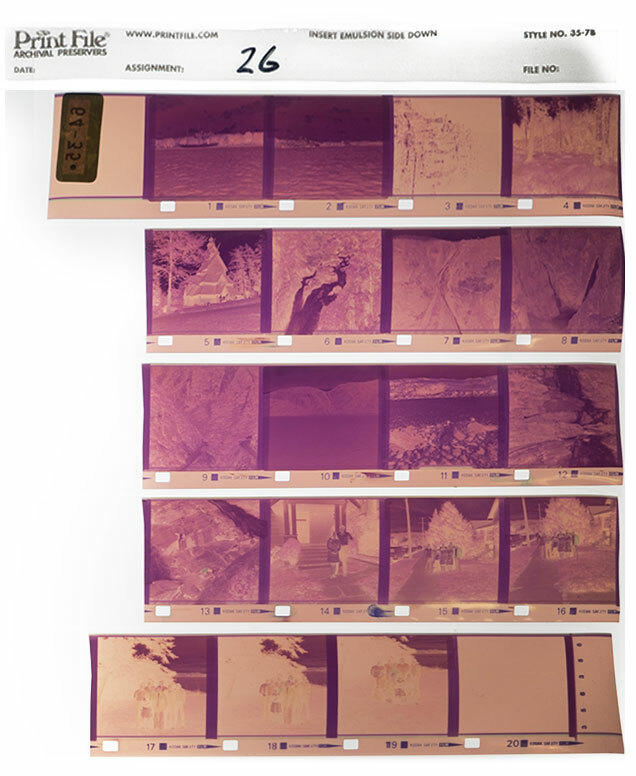 What you see in the upper image is the film processed into a B&W negative – the safest way to process most outdated color film (one exception is Kodachrome which is only available to be processed into B&W). We determined that the B&W version of the negative was in pretty good condition. A “security” scan was made of all of the pictures on the roll. Then we ran the film through a further process known as film acceleration, to bring the negative into color, as you see in the lower image. Not only did we get color, but by doing this additional process, we ended up with a higher contrast version than if we had gone straight to color (without the initial b&w processing step). In the above case, the B&W version of the picture is clearer, more like a new B&W film. The color version has appealing aspects to it for some people. We let you decide whether trying to get color results is important to you. Is it worthwhile asking us to accelerate your film? In section 3 of our order form you have the following options for most of your color film. Process into B&W first, do a security scan and then when “reasonable” accelerate into color. Add $10.00 to the usual processing fee, if applicable. Process into B&W first, do a security scan and then reprocess into color regardless of the results in B&W. Add $10.00 to the usual processing fee, regardless of color outcome. If you are on a budget then option one is a good choice. If color is important to you then option two is a good choice and we will only “accelerate” into color if we think there’s a decent chance of getting fair color image. Option three is for those that aren’t concerned about the price and want to make sure they have seen all possible options, no holds barred. Kodachrome and B&W films can not be accelerated! Q?What the heck is an “Master Image Sequence” and why is it important? You will notice that all our transfers come with a high definition “Master Image Sequence”. The “Master Image Sequence” is a very high quality version of your film greatly exceeding the quality of what is possible on DVD and also above and beyond most digital video file types designed for viewing or editing. Essentially it is each and every frame of your movie preserved as a high resolution jpeg or tiff photograph — in the movie industry it is also called a “numbered image sequence”. When DVD is as dead and gone as Betamax, you will be able to make very high quality copies from your archive copy to whatever the current media is. It’s an insurance policy against obsolescence. Please Note: We will require a hard drive to put your master image sequence on because the files are very large. We will advise you on what size of drive you will need to provide. Please make sure you send us a large enough drive! Alternately, we can supply an appropriate new drive for you. You do have the option of not taking the master image sequence version of your film but in good conscience, we can’t advise it. Q?What do I need to know about your print scanning service? Often in a family archive there will be negatives and prints that were made from those negatives. When scanning we will scan all of the film first before we start scanning prints. If we recognize that we are scanning prints of images that have already been scanned from the film we will avoid doing these but these can very easily be overlooked in which case you would be charged for the scanning of both versions. A good approach would be to first send us your film to scan and once returned to you, you can sort out the prints that don’t and do need to be scanned. Scans made from the negative will be higher quality than those made from the prints. We don’t use bulk print scanners such as are used with most “shoebox” scanning services. We considered doing our print scanning by this method but upon further research we realized the quality wouldn’t be up to the quality of our film scans. To add to that, other better scanning companies were abandoning the service due to quality issues. We are using a top end flatbed scanner and each print must be loaded and previewed before scanning. These are not unattended scans where a large stack of prints are dropped into a feeder and left unattended. Q?What is done for dust and scratch removal with your scanning service. Color film images take advantage of Fuji’s Image Intelligence dust and scratch removal. Because hardware based dust and scratch removal such as Image Intelligence and Digital Ice only works with color images, B&W images and prints are receive electronic anti static dust removal and are blown with compressed air before scanning. If you opt for our scanning with Photoshop service, some additional dust and scratch removal is done by hand in Photoshop. Q?What resolution are scans made at with your scanning service? Unlike most other scanning services, we don’t offer a myriad of confusing scan resolutions at different prices. We simply give you a large enough scan from whatever format of film you give us to make a high quality large blow up print of your images. This providing the orignal integrity of your image lends itself to this. We provide large enough scans for virtually all practical purposes. For those that would like to know what resolution we scan at please see the chart below. Scan resolution for all film formats listed in our prices will allow for at very least a 20 inch blow up (3600 pixels) on the short dimension of the frame. A square frame can be enlarged to 20 x 20 print with no digital artifacting and a rectangular 3:2 aspect ratio picture (35mm) to a 20 by 30 print. This is enough resolution for virtually all practical purposes. Print scans are done at 600 dpi allowing for more than 2 times the enlargement size of the original print, although – scans from prints are not optimal for blow ups. When possible provide the negative the print was made from as a higher quality scan is possible from the negative. * Albania, Andorra, Belgium, Bosnia-Herzegovina, Bulgaria, Canary Islands, Cyprus, Denmark, Estonia, Faroe Islands, Finland,France (including Corsica and Monaco), Gibraltar, Greece, Greenland, Hungary, Iceland, Ireland, Italy, channel Islands, Croatia, Latvia, Liechtenstein, Lithuania, Luxembourg, Macedonia, Malta, Moldova, Montenegro, Norway, Ukraine, Austria, Poland, Portugal (including Azores and Madeira), Romania, Russia (includingAsian part), San Marino, Serbia, Slovakia, Slovenia, Spain (including Balearic Islands, excluding Canary Islands), Czech Republic, Turkey (including Asianpart), Vatican City, United Kingdom, Belarus, Sweden, Switzerland. ** Belgium, Luxembourg, Denmark (excl. Faroe Islands and Greenland), Germany, France (incl. Corsica and Monaco), Italy (excl. San Marino and Vatican City), Austria, Spain (incl. Balearic Islands, excludingCanary Islands), United Kingdom (excl. Gibraltar and Channel Islands), Sweden. With packages larger than 2 Kg at shipping cost plus €5 handling. Q?Can I pay by check? We do not accept payment by check or post office money order for still film developing services because final prices are variable (depending on the number of images that turn out, how many images you may order, or if your film turns out at all). We accept payment by MasterCard,Visa or Paypal. We will accept payment by check or post office money order for other services up to a maximum of $100 USD, only if a final price can be predetermined. No refunds will be made for amounts less than $5. Q?What should I know about paying by credit card? All credit card transactions originate from our lab, which is located in Saskatchewan, Canada. Some financial institutions in the USA will charge an “international transaction” service fee, even though we bill in US funds and foreign exchange rates are not involved. These service fees are not something we charge or have any control over; they are completely at the discretion of your financial institution. If you are unsure of your Mastercard or Visa card issuer’s policy on transactions originating in Canada, or whether transactions outside of the USA are even allowed, please contact them before you send your film to us. Q?I Have Expired Film…Do I Need Your Service? Color film that is less than 5 years past its best before date and has been stored in excessive heat: you should be able to drop off any local photo finishers with a good reputation and get at least some OK prints. Color film 5 to 10 years beyond the “process before” date that has not been stored in excessive heat: if it is important to you, then send it to us. If you are simply curious what is on the film, normal processing will likely give you fully recognizable though possibly poor quality images. B&W film in cassettes (126/35mm) approximately 20 years beyond its “process before” date would best be sent to us or someone with an understanding of how to process a film to its highest possible contrast. B&W roll film (120/620) approximately 30 years beyond its “process before” date would best be sent to us or someone with an understanding of how to process a film to its highest possible contrast. 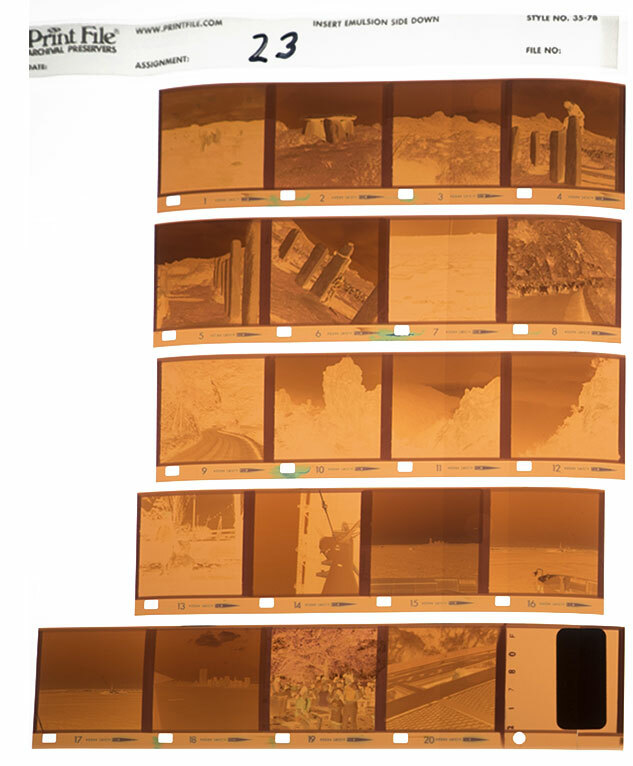 Color film that has been in excessive heat over an extended period (i.e. a film left in a car parked outside for an entire summer season): if it is important to you, then send it to us. If you are simply curious what is on the film, normal processing will likely give you recognizable though poor quality images. Q?What Type of Film Does Film Rescue Process and what can I expect? At Film Rescue we process any and all old, expired, deleted and antiquated films. It’s what we do. If you approach us with a film that is a current process we will first determine from you whether you need us or not. Most films that are only expired by 5 or 6 years or so will come out ok processed by a reputable local provider. If your film is older than this we will want to have a conversation on exactly what you have, how important it is to you and how you think it was stored. With this information we can normally give some useful guidance on how you might want to proceed. We honestly don’t want to be selling our premium service to people that don’t need us. Our lab notes which give us guidance on the best way to process a given film has a database with an excess of 350 unique film types. The following is a list of the most common films that we develop on a regular basis. Following the film is a percentage of this type of film that comes out as recognizable and the quality trend for that film. Keep in mind, the quality trend is only a trend – some will be better and some worse. Very Poor — You can for the most part make out what is on the film but identifying people can be a challenge. Poor — You can easily identify people and places but the images are very harsh and grainy. Fair — Pictures are clear and easy to look at but not perfect. They may be lower contrast and have problems with blemishes and edge fogging. Good — The pictures aren’t perfect but they are completely acceptable. They may appear grainier than a normal new film. Very Good — Little difference between it and the quality of the pictures from a brand new film. Q?How are your processing techniques different than a normal lab? We keep very careful records on how a specific film is responding in a specific process. None of our processes are the same as what was originally intended for the film. All have been modified and tailored to our past experience with each film type, brand and format. 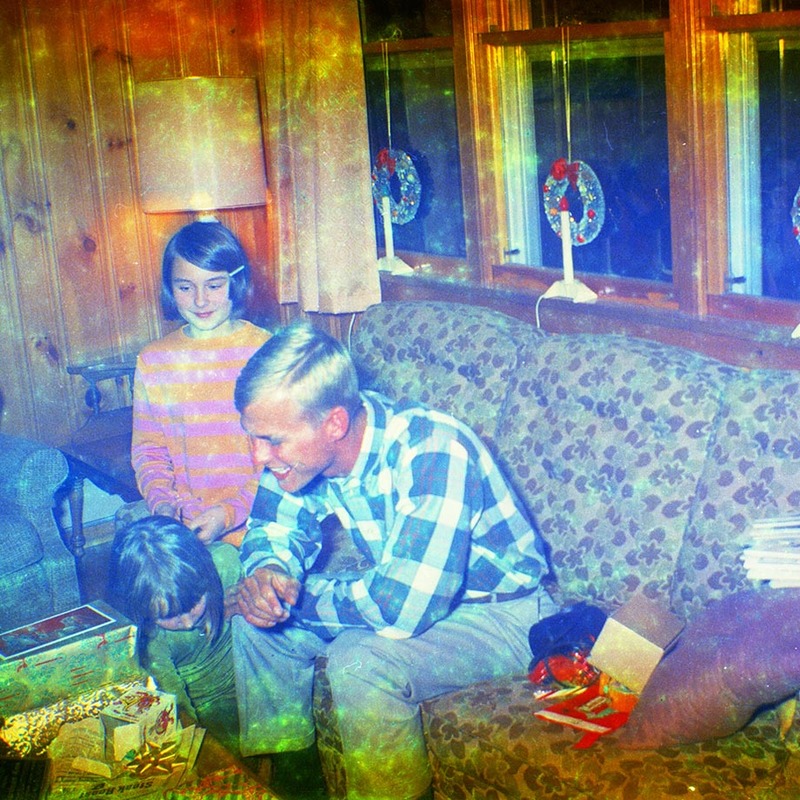 The original process is not at all appropriate for salvaging images from long expired film. 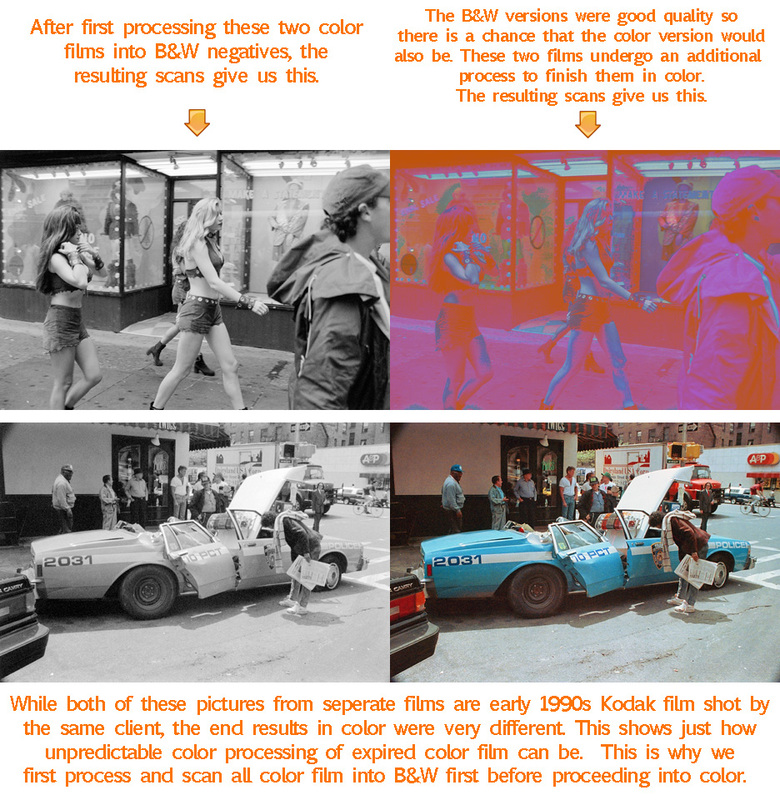 In order to salvage the best possible image from a film, many of these processes result in a Black & White image even though it may be a color film. In our opinion it is better to get a higher quality image in Black & White than a lower one in color or alternately to get something recognizable in Black & White than nothing in color. Cycle turnaround time may be as short as 8 weeks and as long 12 weeks during a particularly busy cycle. Unlike a conventional processing lab that may have one or two large-volume processes under their roof, we have 12 small-volume processes. This creates the need to complete one process before we move onto another, mixing chemical and preparing for each before we move to the next. It is not until all the film is developed that scanning and transferring begins. Once that step is complete, the digital work is done and then the uploading begins. Please do not wait until near the beginning of a cycle to send us your film. This not only slows down the lengthy administration process that at the beginning of each cycle (thus, ultimately slowing down our turn-around time) but you also risk missing the cycle cutoff altogether. Doing this well and properly at a reasonable price takes time. We encourage you to have a look at and consider others offering a similar service. Q?Do you offer rush processing? Rushes and unique set ups are not encouraged but are available. Unlike a conventional photo lab that deals with larger volumes of a single film format of only one process type, Film Rescue is processing smaller volumes of film, multiple formats and has 12 unique processes. This creates the need to process in batches — first completing the processing of all film in house before moving onto scanning and transferring. To break from this cycle is not always possible please contact us if you wish to arrange for rush processing. All other services – We do our best to accommodate when possible with no extra charges – please enquire. Q?I want to shop around – who else is doing this type of work? Q?Do you return spools, boxes or cassettes? We are happy to return film spools and cassettes that are identical in their function. For instance…if you send us a 127 spool we will send you a 127 spool back. We will try to get your original film spools and/or cassettes back to you but this is not guaranteed. We have found it exceedingly difficult to have a working system of keeping track of peoples film packaging while dealing with hundreds of rolls of film in the dark. A very effective system is in place for keeping track of who’s film belongs to who but within the system there is no practical way to also include the film packaging. Most often we will get you your precise packaging back but this is not guaranteed. The film spools, cassettes and boxes are of little or no monitory value. Q?What image size do you provide if I place an on-line order? Images delivered online are more compressed than their CD counterpart though ultimately you will see no difference. Well…we just made up the term so I guess we can also define it. This is a picture with a pixel dimension and a level of compression that allows for fast uploading to various social media sites such as Facebook, Flickr and Twitter. They are also small enough to easily e-mail to friends and family. How large they appear on your screen is dependent on where you have your screen resolution set but they will fill one fifth to one third of your average screen. The pixel dimension for a image with a 2:3 aspect ratio (same as most 35mm film frames) is 864 x 576 pixels, for a square picture (126 and many roll films) is 705 x 705 pixels. While you might be able to squeeze an “acceptable to some” snap shot sized print out of these, they are too small for what would normally be considered enough resolution for this purpose. Q?What is included with “hands on retouching”? 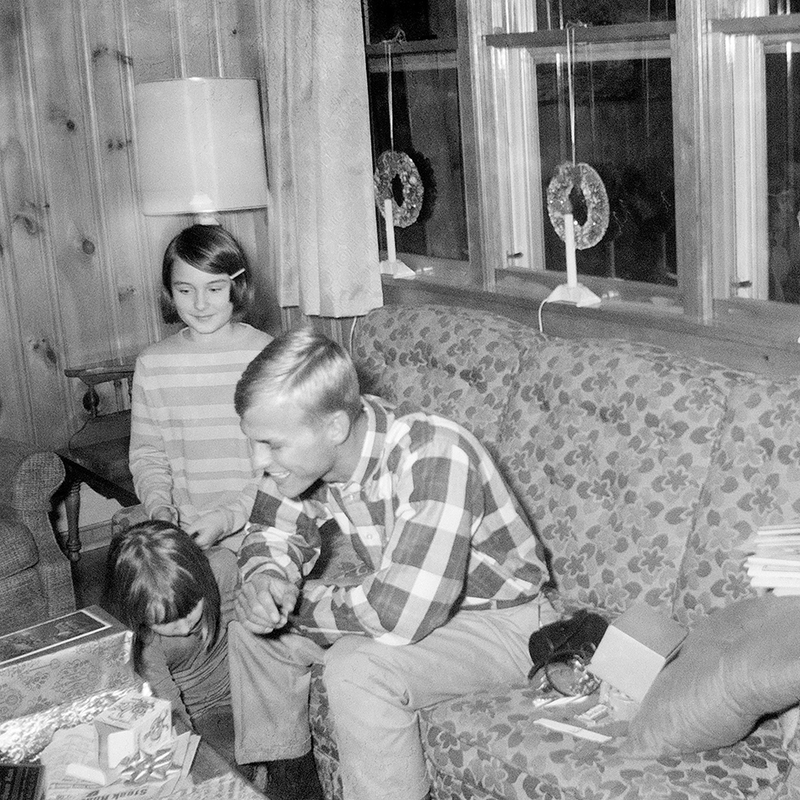 After scanning, images are adjusted for brightness and contrast, degrained and sharpened. These are the images that you will see in your gallery and that are available for free downloading as a small net sized image or to purchase as a large sized image. Some images will benefit a good deal from a more extensive hands on retouch but not most. If your picture is much lighter or darker on the edges of the frame than in the center or if the picture has a lot of pitting or dust settled into the emulsion, order the image with hands on retouching may be worth while. You can contact us specifically regarding your order if you have questions. Q?What can I expect of images uploaded to me for downloading? When you are ordering images from your gallery, upon checkout you will be prompted to choose either physical return of your scans i.e on cd, and/or prints or to simply download the pictures. If you choose the download option, the image sizes are more compressed than what you’d get on a cd — but there will be no additional shipping charge to pay. The pixel dimensions of your picture will be identical and the additional compression will not discernibly degrade your picture. If you choose this option, nothing is physically returned (unless you’ve indicated on your original order form for your negatives to be returned). You will receive a link from Dropbox.com where we “park” the image files for you to download. There are no additional charges from Dropbox.com for this service. Images are 8 inches at 300 DPI on the short dimension or your frame. Example — a 35mm frame would be 8 x 12 inches at 300 DPI — a 110 frame would be 8 x 10 inches at 300 DPI. Often orders are copied to DVDs unless CDs are specifically requested. By default the images will be in the JPEG file format but PSD and TIFF are available. Q?Do you offer “process only” for still film? The short answer: no. In past we did offer “process only” at a discount of 10% for people who wanted to scan their own film. We have discontinued this because too often we were having films returned to us that the client was unable to scan due to the condition of the film, that we were able to scan because we are experienced in dealing with scanning very dense or faded negatives. This isn’t to say that your negative won’t be home scannable but we don’t know people capabilities and won’t be responsible for that. The savings that we were offering for “process only” we feel is easily offset by the security of having digital files of your pictures on-site here when shipping, and the fact that you get an early preview of your images in a gallery. Essentially, you can still have process only but if you are unable to scan your film when you get it back, we will have scans here already so there is no need to send anything back to us. Here are some reasons why the scanning is often best left to us…. Some negatives are “accelerate” which means they are first processed the safest way possible into a B&W negative and then a security scan taken of those B&W images. After, many color films get reprocessed into color which sometime renders a better or more desirable color image than the B&W version of the pictures. But as often as not, the color version will be extremely faded and shifted and in these case we have safely stored the originally processed into B&W versions of the pictures for the client. Some negatives after processing are as dense as welding glass and conventional scanners can not see through them. Some negatives have such an extremely faint image on them they can not be recognized with the preview scan on a conventional scanner making them very difficult to locate your marquee correctly during preview. Auto frame selection will not work on these negatives. Do not assume if you don’t see images upon a quick inspection, there is nothing there. Some films such as GAF cassettes and Triple Print blue label films are processed into an unstable reflective negative that begins fading after processing. Not only do they need to be scanned right away, they are scanned wet because the contrast on the film is much higher when wet and they can not be scanned on a normal scanner because light will not pass through them. Q?How do you define “recognizable images”? When we are deciding whether to scan or not scan a client’s film, we are doing a visual inspection of the processed negative. It is often difficult to tell what the final quality will be without scanning and enhancing the negative. Therefore, we’ll continue with scanning and enhancing any film that we see think we can see something on. We don’t want to be in the position of trying to make a subjective determination as to what may or may not be important to a client. One person’s trash is another’s treasure. An image that is out of focus, double-exposed or low quality can still be recognizable. Q?What is the “client preview” and on-line shopping cart? Once we scanned and Photoshopped ™ all of your pictures we create a gallery on our website for your images. We then send you a link via email to your gallery where you can see your pictures and download “social media” sized images. From there, you can pick and choose the images that you want to be copied to CD and/or uploaded to you as large image files. There is no obligation to place an order and your online gallery will remain active for one full year. It is a fairly standard on-line shopping cart though the payment feature has been disabled as we will already have collected you payment details. Q?What is the “digital fix-up” included in the base price of the still film processing service? After scanning, images are adjusted by human eye for brightness, color (when applicable), sharpness and contrast. This work is done using the world’s standard professional photo editor Photoshop CS. The difference between this approach and the approach used by a conventional photo finisher is night and day. Most commercial high volume scanners allow only for a very simple brightness and a color adjustments. Using Photoshop CS is integral to doing this work properly. Q?What size of still film scan do you provide? Our scans for previously undeveloped film, result in an image that is 8 inches by 300 DPI on the short dimension or your frame. Example — a 35mm frame would be 8 x 12 inches at 300 DPI — a 110 frame would be 8 x 10 inches at 300 DPI. Because we are so often dealing with very low contrast negatives the scans are done at a high bit rate, then adjusted for brightness and contrast before down converting to 8 bit JPEGs. This creates a smoother grain scale than would be possible had the images been adjusted for brightness and contrast at 8 bit. Our scans for most previously developed film is 12 inches at 300 DPI on the short dimension of your frame. Q?What are my options with EM-25 process Ektachrome 160 movie films? These films were manufactured pre-1984 and are a minimum of 25 years beyond the process before date on the original packaging. The availability of one of the chemical components required to process these films properly into color is dwindling (worldwide). In an effort to conserve our reserve of the chemical, we have had to raise the price per roll. If you are confident that your film has been stored consistently in cool temperatures and/or color is extremely important to you, specify that you would like color processing on our order form. If you know that your film was not stored properly or if you are unsure of the storage conditions, the black & white negative process we offer is the safer approach to salvaging something from your film. Transfer from a negative to positive (Black and White) will allow you to view it from video. You can tell if you have EM-25 process Ektachrome film by looking at where Ektachrome is written on the film cassette. EM-25 process film is written in white in a small blue box. With EM-26 process film Ektachrome is written in blue in a small white box or on top of yellow with a blue border around it. Q?How will my old movie film be processed and what can I expect? Please keep in mind that your film may be decades beyond its process before date and what we are doing here is a salvage job. 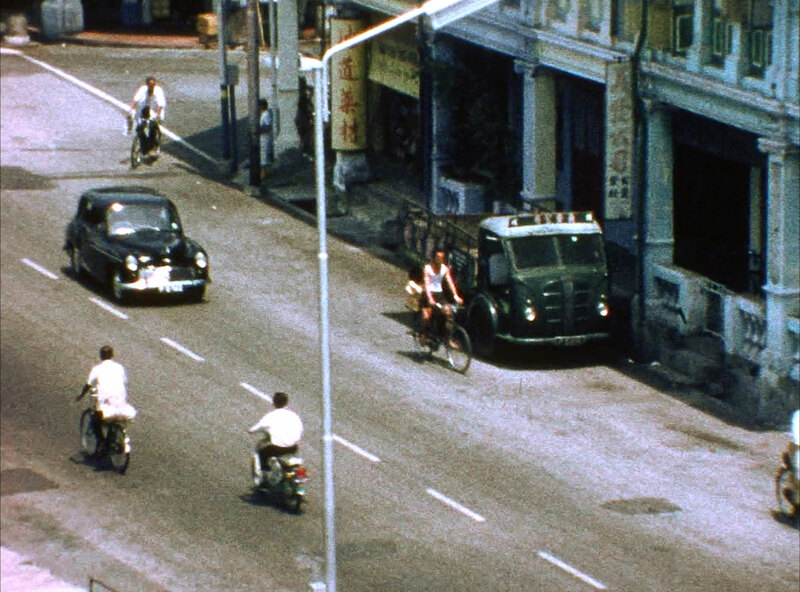 We do our best to get good quality images from these very old films but the results are highly variable. The quality we get range from good to just barely discernable. Kodachrome — Can only be processed into a black and white negative which is then transferred to a black and white positive as an AVI, MOV or DVD. There is no color processing option for this film anywhere on earth. Ektachrome process EM-26 – By default, this is the only vintage movie film that we are processing into color. You can request on the order form that it be processed into a B&W negative instead of color if you wish to take the safest possible approach to salvaging something from the film. They almost always do turn out at least as recognizable in color but the B&W version of the image can often be better quality. Ektachrome process EM-25 — By default this is processed into a black and white negative which is then transferred to black and white positive as an AVI, MOV or DVD. Color process is possible, if requested, but there is a $14 surcharge (for 50’) and the film is less likely to turn out. More information on EM-25 film, including identification. In color the chance of a recognizable image is about 80%, while black and white is near 100%. All other movie film – By default these are processed into a black and white negative which is then transferred to black and white positive as an AVI, MOV or DVD. Color process is possible, if requested, but there is a $14 surcharge (for 50’) and the film is less likely to turn out. B&W film is of course processed into B&W but this has stood up much better over time than color film and if your film is less than 20 years old you may want to consider using another provider who can do it faster and at less expense. Q?What can you tell me about your transfer? Our 8mm and Super 8 transfers are top quality and comparable with the best transfers available. 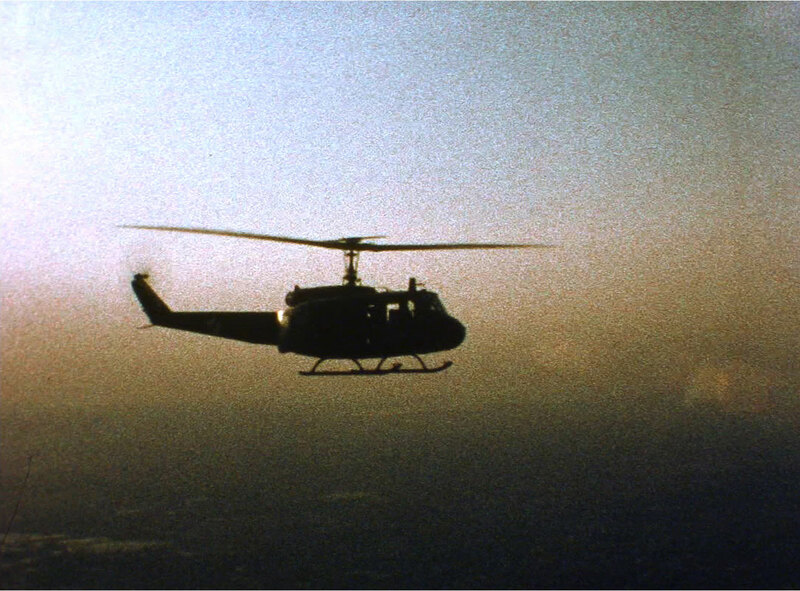 Our 16mm film transfers are of average quality and at a reasonable price. If a top quality 16mm transfer is required we are happy to give referrals. When clients supply small reels, they are not spliced onto larger reels (which is common with most transfer providers). Each reel becomes its own chapter title or digital file. The client is encouraged to number the reels in the order they wish their film to be transferred. Chapter titles or file names up to 18 characters can be supplied with each reel as well. With all options, film is cleaned before transfer. Cleaning will remove the worst of the dirt but usually some will still remain. Minor damage to film is repaired without additional charge. If damage is more severe the client will be contacted and quoted as to the cost of the repair before the transfer proceeds. Color correction is done digitally following projection/recording. Color correction is virtually frame accurate and applied when moderate to extreme color shifts occur. New corrections are not applied for minor shifts and very short scenes with any transfer option. Color correction is subjective and severely altered colors may only be able to be corrected so much. If color shift is very extreme, film can be converted to black and white. Below are two sample frame grabs from our transfer. Keep in mind these are coming from tiny pieces of film. Q?What’s better to transfer home movies to HD or SD? On a frame by frame scanner, the difference between SD vs. HD is obvious. On older transfer systems in some ways the SD transfer can be more desirable because in HD you simply seem to have a more obvious grain and the softer SD transfer can seem more pleasant to look at. With a true scanner there is a bit more obvious grain as well but there is also a more obvious clarity to the image than the SD version of the same footage. It may come down to taste on some level but we have confidence that in general HD is a better way to go. Should you not like the HD version of your film transfer it can be easily down converted to SD. It doesn’t work the other way around. Q?How should I have my film organized for transfer? If you are requesting a DVD or a Blu-ray disc from us, the order your film is in becomes more important than if you are requesting editable computer files from us. On a DVD or Blur-ray disc, the order your film plays in is pretty much locked down to the order they are transferred in. With editable computer files you can put them into any order you like. You can do this by simply renaming the files so that your computer or smart TV plays them in the order you want or put them into a software editor, edit to your hearts content and then burn your own DVDs or Blu-ray discs. We still encourage you to number your reels in the order that you wish them transferred so you have a somewhat organized transfer. Unlike many providers, all films are returned on their original reels and in their original boxes or cans, maintaining the integrity of your family archive. With MOVIE FILM, when we capture it on our scanners, a very large high quality computer video file is created. To create a DVD that will play in a home DVD player, we must compress them to a fraction of their size because the amount of data a DVD can store is very limited. With VIDEO TAPE, the bit rate we capture at is much higher than what we are able to do to a DVD with a two hour play time. While this isn’t quite a critical as it is with movie film, it’s still a real quality issue. To add to the issues of lower quality when converting movie films and video tapes to DVD, DVD was designed by the movie industry to be hard to copy. While not impossible, doing the DVD “rip” that is required to make the copy, further degrades the image. Even if you don’t understand the technology, it is definitely worthwhile keeping a high quality digital master for family members that do or that will. DVD is slowly becoming what VHS was in the 90s – robust computer files will remain relevant and are expandable into the future. Q?Do I need to supply a Hard drive for my movie transfer and if so what size? Regardless of the size of your order, if you select MOV, MP4, DNX or master image sequence, a flash drive or portable hard drive is required. We can supply a brand new drive for you (price varies) but you will likely find better pricing for the drive at a local source. Give us a call and our transfer technician can advise you. Toll free (North America) 1-800-329-8988. Please note: Any used drive provided to us must be reformatted and all previous data on the drive will be eliminated. Your order will be delayed if you decide to send a drive after we are ready to begin work. Film Rescue International reserves the right to use photographic and motion images for promotional purposes when work has been requested, completed and then not paid for after a period of one year.